The distinct anise-like taste of caraway fuses perfectly with cabbage. Bill and I both like cooked cabbage and I was happy to see this recipe in the American Heart Association Cookbook. The spicy mustard, yogurt and seasonings round out the sauce smoothly, making this cabbage a tasty side dish for most any meat. Try this, if you’re a fan of cabbage too! Steam the cabbage for 5 minutes, until tender-crisp, drain, set aside. Meanwhile, in a medium saucepan, whisk together the sauce ingredients. Cook for 2-3 minutes on low, until thickened. Add cabbage and stir until well coated. Cook for 2-3 minutes, or until heated through, don’t overcook. These shrimp never touched a barbecue grill! 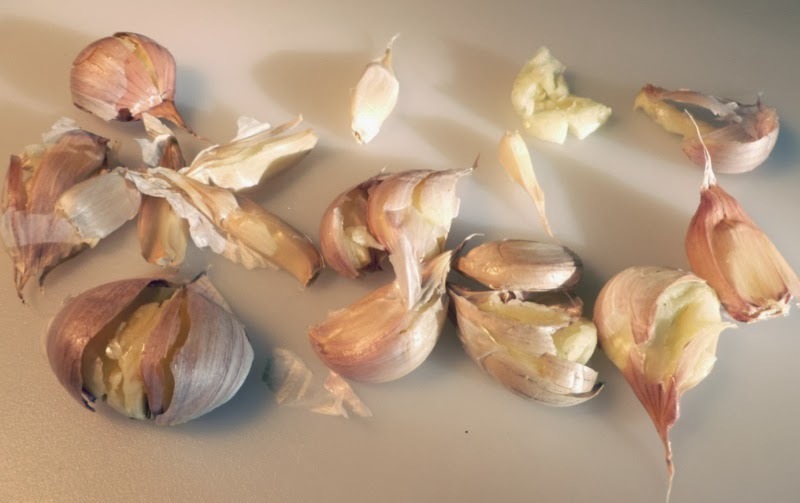 And, 12 cloves of garlic may sound like a lot of garlic, because it is a lot of garlic, but cooking mellows its bite, leaving a pleasing taste. You might want to use butter instead of Promise Activ Spread. If you’re not acquainted with Promise Activ spread, you’re in for a surprise as it has a good butter flavor for cooking and baking with a smooth texture; plus, it’s recommended by the American Heart Association and Mayo Clinic, as it’s low in saturated fat and helps maintain a healthy heart. Back to this dish, you’ll just have to try it to see how delicious it is! It’s a keeper!!! In large skillet, combine light spread, garlic and thyme. Cook and stir over medium heat until melted. In medium bowl, combine sherry, paprika, Worcestershire, salt and pepper. Add shrimp, tossing gently to coat. Add shrimp to skillet, cook and stir for 3 to 5 minutes, or until shrimp are opaque. Las Vegas was a blast as usual, and Elton John was the best. The photo below is the gargantuan project under construction, to open early 2014. To give a little perspective, the photo is taken from the 21st floor of the Flamingo, in the very middle of the strip, where the Ferris wheel is located. It is to be the largest Ferris wheel in the world: 28 pods, holding 40 people, that’s over 1100 crazy brave people, floating over Las Vegas, 550 feet into the sky; taking anywhere from 30 minutes to an hour for a revolution; according to which story you read. The temperature is really falling here now, and there’s something about the cooler weather that makes a hearty healthy vegetable dish like this very appealing. Maple syrup, squash and carrots were made for each other. Broccoli adds great color and ups the nutritional value of the dish, with pecans adding a nutty crunch to the mix. Toss together first 7 ingredients (up to syrup) in a large bowl. Spread vegetables out on rimmed baking sheet (may need two pans). Slide into oven and roast, stirring twice until broccoli is browned and all the vegetables are tender, about 40 minutes. Pour maple syrup over vegetables, stir. Scatter on nuts and toss. Buen apetito and Hasta luego! Woo hoo! Bill’s 50th high school reunion is this weekend. Then we’re off to Las Vegas again. He surprised me with a suite and “front row” seats to the Elton John concert! I don’t believe I’ve ever combined dill with pork, but I will from now on. I adapted the recipe for this rub from “Real Simple” magazine. It stated that the rub is also good for bone-in chicken pieces and shrimp. Trust me, it’s delicious! The blend of ingredients definitely surprised skeptical me, and we had a tasty couple of pork chops for dinner. You will just have to try it to believe it! Lightly spray chops with cooking spray. In a small bowl, mix remaining ingredients. Rub chops well with mixture. Bake until thermometer registers 145-160 degrees or juice runs clear. Cornbread is a favorite of mine and I found this lightened up version that’s delicious. I’m not saying it’s better than the traditional cornbread, but it fills the bill for a cornbread craving! This cornbread is moist and fluffy with a bit of tang from the buttermilk. It’s adapted from a Cooking Light recipe; using stone-ground cornmeal to give it a great coarse sandy texture. Simple, good and easy! Coat and 8-inch square baking pan with non-stick cooking spray. Add cornmeal and flour to a large bowl. Whisk in salt, baking powder and baking soda. Combine buttermilk, egg substitute and oil in a small bowl and mix thoroughly. Pour buttermilk mixture into well of dry ingredients and combine, do not over-stir. Bake 20 minutes, or until toothpick inserted in center comes out clean.